Thanks for all the work that you guys do. He have been very happy with Sheamus (Now Drago, the Russian boxer from Rocky 6) He is a total clown and learning well. He is getting better about house training and has learned to sit, which is break thru for him. He treats our other boxer well and she has accepted him, she actually picked him out. He likes to chase my cats around the house, it is ok as these 2 8-10yo cats have been thru this before and will train him well. Once again thanks for connecting him to us, he is already a spoiled boy!. 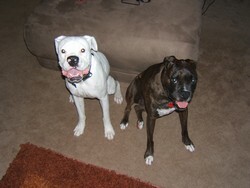 Attached is a picture of him and ellie our brindle female.